This Saturday, August 9th at 4pm Del Frisco’s Grille will be opening its first location in Orange County at The Spectrum in Irvine. 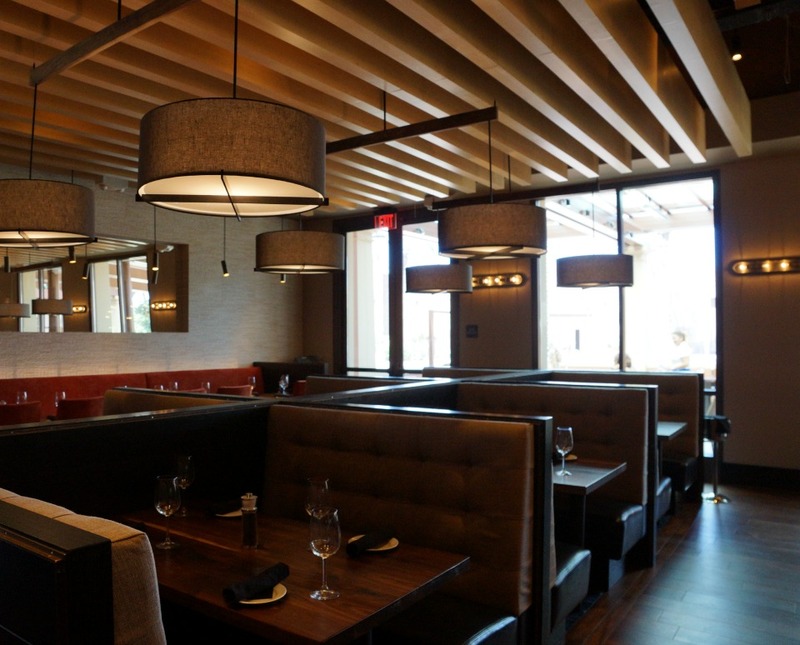 This upscale bar and grille, the more casual sibling of Del Frisco’s Eagle Steakhouse serves up American cuisine including gourmet burgers, chops, seafood, and of course Prime steak along with hand-crafted cocktails, beer as well as an extensive wine list that includes a solid selection by the glass, carafe or bottle. This week Shelby and I were able to get a sneak preview of the restaurant. It was a hot and uncharacteristically humid day for those of us spoiled by Orange County weather, so escaping into the cool vast space of the restaurant was a relief. The first thing that struck me when I walked in through the massive entrance was the dark, large sleek bar area with modern elements. 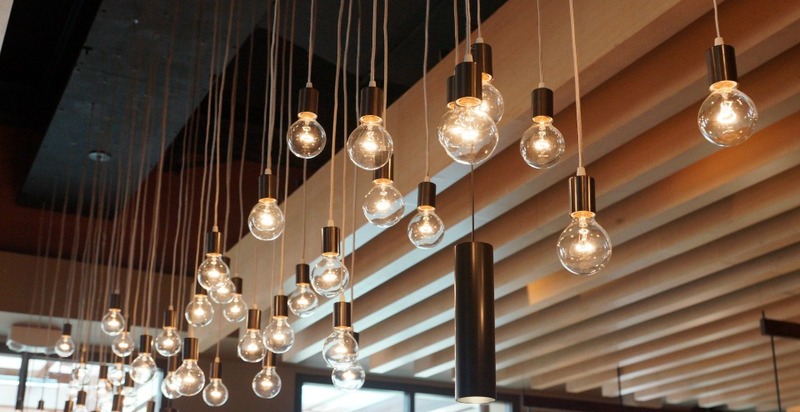 The restaurant itself however takes on a different feel with its use of warm earthy tones, comfortable upholstered seating, and mixed textures for a casual yet still sophisticated atmosphere. Once seated we were offered something from the bar and given the heat, The Morning After hand-crafted cocktail with Pearl Coconut Vodka, coconut water, fresh lemon sour and a splash of Sprite served on the rocks that our waiter recommended sounded so refreshing. 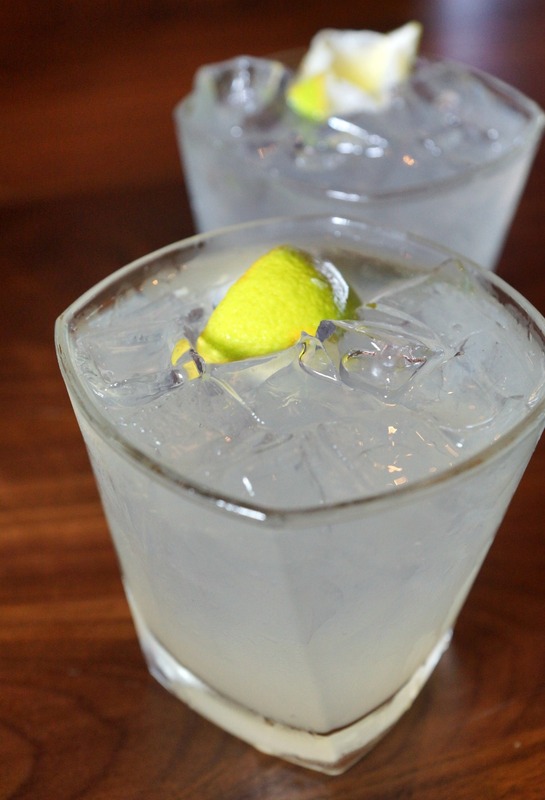 I love the flavor of coconut and this has that wonderful tropical flavor, but is light with just a touch of sweetness and a refreshing citrus taste. From there we sampled a variety of dishes. We started out with what may have been my favorite dish of the day. The Cheesesteak Eggrolls are a play on the Philly Cheesesteak Sandwich, but in a fried eggroll shell rather than bread. Served sliced lengthwise you get a generous amount of medium rare steak dripping with warm gooey cheese, topped a with honey mustard sauce for a little zip, circled by a crispy shell. A sweet and spicy chili sauce balances out the big salty flavors of the dish. I’m not sure where these things originated, maybe they are “a thing” in Philly, but I have never had one and both Shelby and I agreed these could be dangerously addictive. They are also filling enough for a meal … I’ll show myself out. 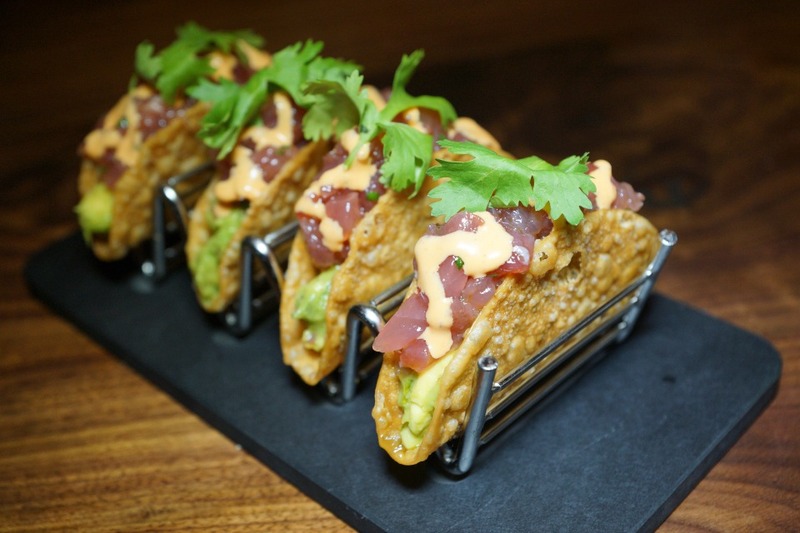 The second appetizer we tried were the Ahi Tacos, a cute and practical way for serving Ahi tuna tartar. These come with avocado and spicy citrus mayo and are served in a mini taco shell so they are easy to eat. This signature dish will be a hit with the Ahi loving crowd. 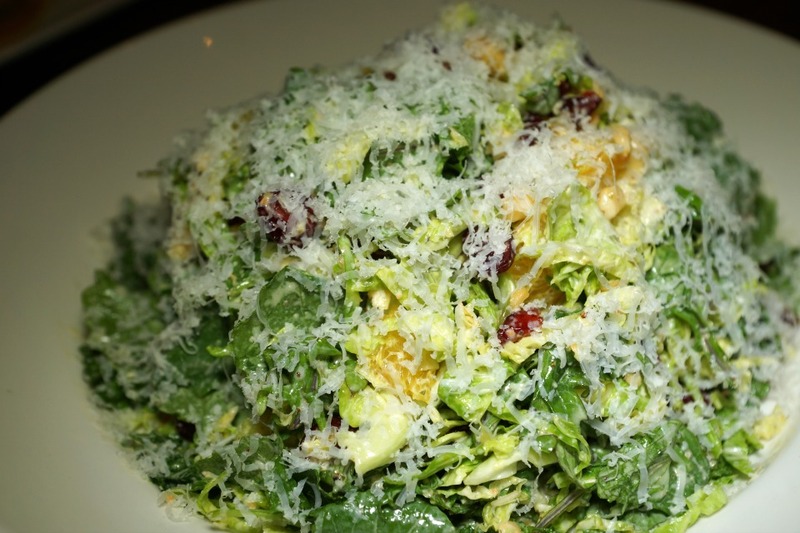 We were able to lighten things up with the healthy, gluten-free Kale & Brussels Sprouts salad. This earthy signature dish is served shredded for wonderful texture and is accented with Marcona almonds, dried cranberries, orange segments, shaved Manchego cheese and Creole mustard vinaigrette. You can add chicken to this as well. Perfect for a light lunch or dinner. 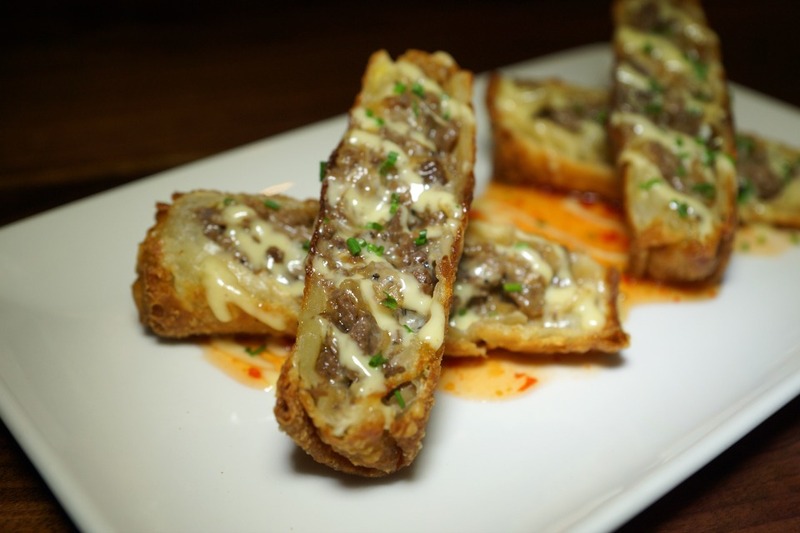 Oh wait… did I say the Cheesesteak Eggroll was my favorite dish of the day? Now I’m torn. This unique take on Eggs Benedict with Crab, replaces an English muffin with a toasted seasoned focaccia. 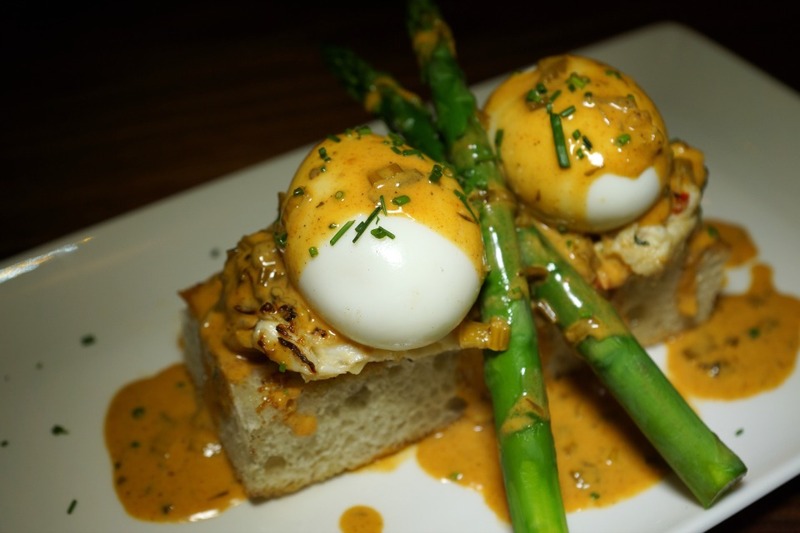 It’s topped with a crab cake that is mostly crabmeat, asparagus, and a Cajun lobster sauce, which is complimented by the perfectly poached eggs on top when they are cut into. 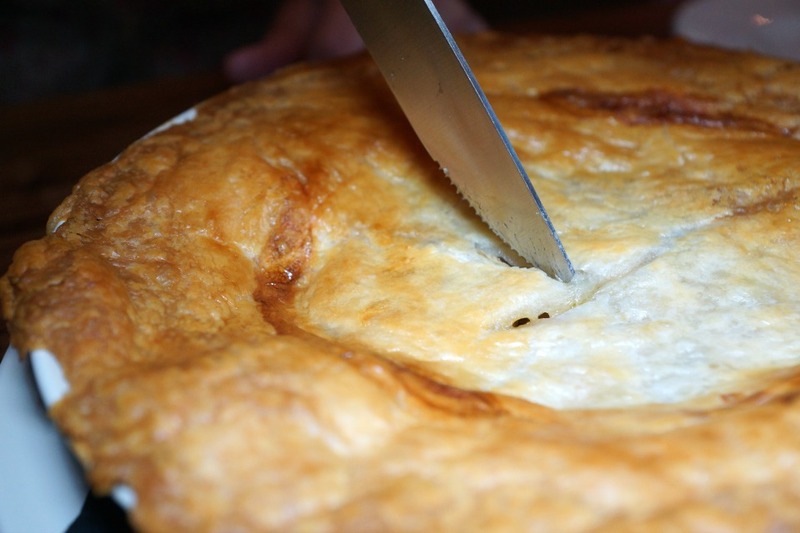 The staff mentioned they were working on some daily specials items including Chicken Pie to be offered on Tuesdays. This just happens to be one of my favorite comfort foods in the world, so they generously brought us out an entire freshly baked pie. The crust was so flaky and good and topped generous chunks of lightly shredded chicken mixed with the traditional peas and carrots and a light sauce. It’s exactly the way you think of homemade chicken pie. Perfect for a chilly rainy day or evening. 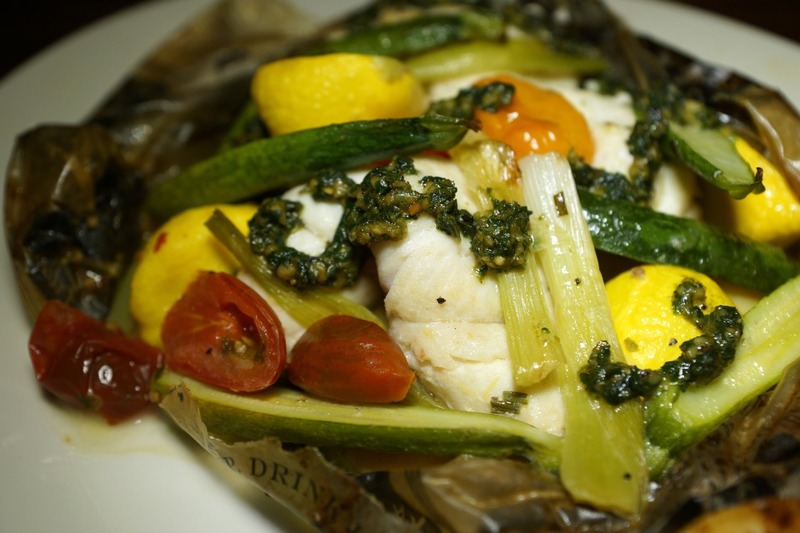 Next up was one of my other favorite dishes the Steamed Brown Bag Fish, a white fish with Farmers Market vegetables and Fingerling potatoes baked “en papillote” with white wine and basil pesto. 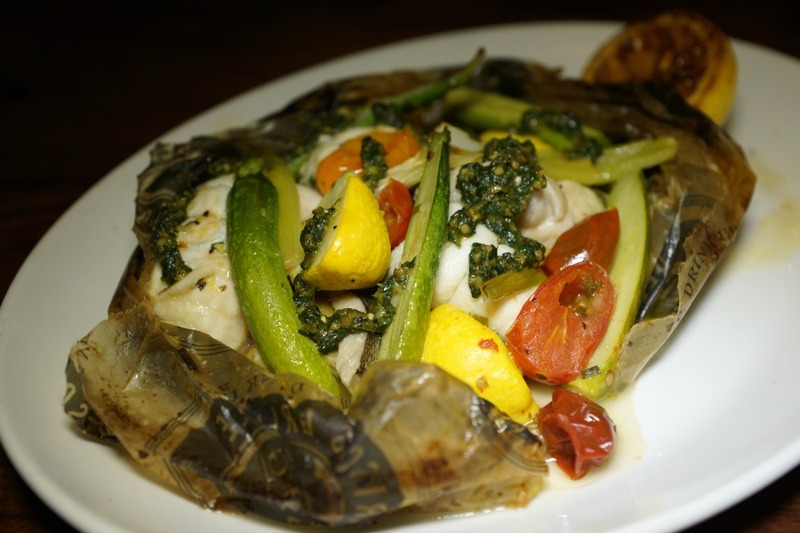 This technique allows the fish and vegetables to gently steam in the wine and absorb the herbaceous flavors of the basil pesto so it comes out moist and delicious. This is an excellent option if you would like a lighter entrée with wonderful flavor that still feels like a meal. It’s hard to imagine there was still more to come and even taking only a bite or two of each menu item, we were both stuffed. But how can you not try the menu item that Del Frisco’s is known for? Steak! 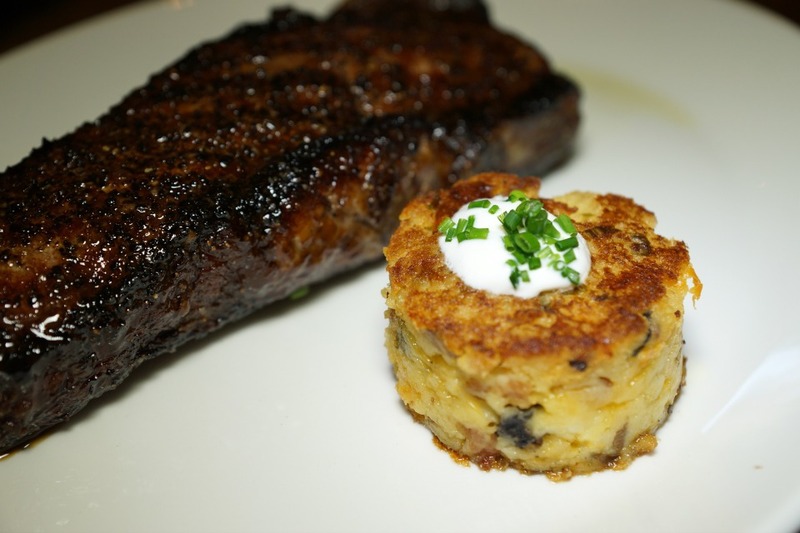 The Prime New York Strip is seasoned with a rub and then grilled. The meat is beautifully pinkish red and juicy when sliced into. I am not much of a dessert eater. 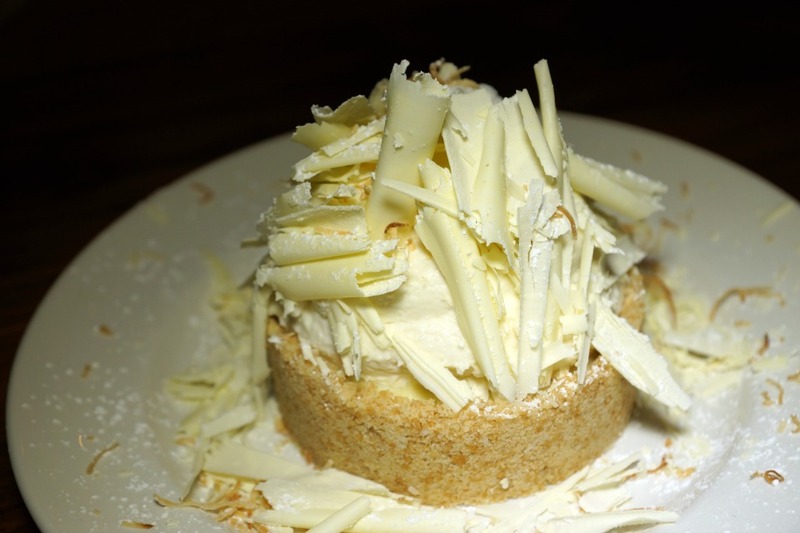 But I did try a bite of the Coconut Cream Pie served on a vanilla wafer crust with whipped cream and white chocolate shavings. I always enjoy foods with contrasting textures and this one is loaded with it. 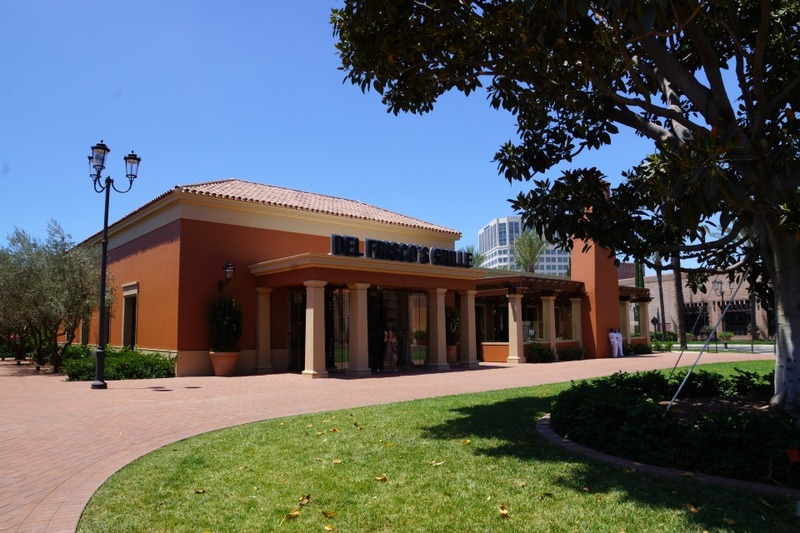 Del Frisco’s is located at The Irvine Spectrum at 620 Spectrum Center Drive. Reservations are available by calling 949-341-0376. Dana Wilde grew up playing “sous chef” for her father as he churned out one amazing meal after the next for family and friends. 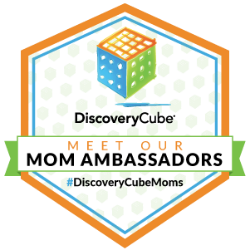 She inherited her father’s life long passion for cooking and has spent the past two decades studying, reading, practicing, experimenting, and creating in the kitchen. Together, she and her sister, Shan are Simply Wilde, a small boutique catering business focusing on in-home entertaining.